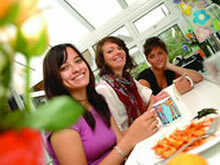 Most students choose to stay with a homestay family when studying at a language school in the UK. Living with a British family has many advantages, as you will have a chance to learn more about British life and culture and also have many opportunities to practise your English. Many British families want to learn about your culture too and that is why they enjoy hosting overseas students. If you want to make rapid progress with your English then this is your best choice. Your UKEAS counselor will give you advice on homestay choices. When your course is booked your counselor will help you select a suitable family and give you more information on the distance of the homestay from the school, the facilities available, and other aspects. Student residence is an alternative choice at some language schools. These are less common, but they do allow for a more independent lifestyle. This is suitable for some students but lacks some of the cultural aspects of living with a homestay family. Older, more mature students seem to adapt better to living in a student residence. In the final analysis it is up to you to make a decision, but your counselor will provide all the information you need to make the best choice.